Come enjoy the mountains and lake. With Homewood Mountain Resort behind the house, ski into the cabin for lunch or the end of the day (depending on snow conditions). Bear Haven is the perfect cabin for year- round indoor and outdoor fun. Located near the south base of Homewood ski area, Lagoon Road is family friendly, close to the bike path and backs up to forest! In summer enjoy our full membership of Chamber's Pool, Beach and Tennis Club. In winter, walk down the road to ski and back to the house through the woods for lunch or at the end of the day! Our rustic getaway backs up to open space, hike, mountain bike, snowshoe or x-country ski from the house depending on the season! 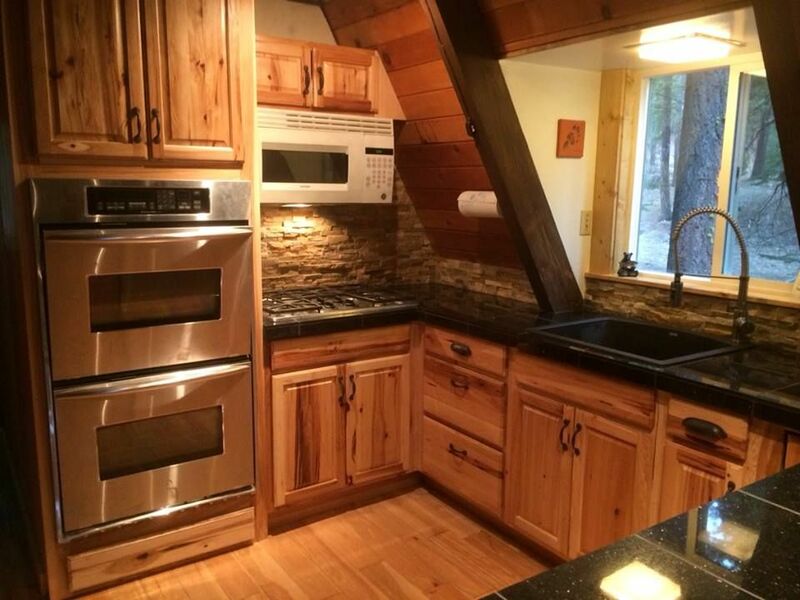 Three level A-frame cabin with a remodeled kitchen: New cabinets, double oven, counters, refrigerator and dishwasher!! We have also added a gas cook top and pantry. New double vanity in the master bath. Always trying to make improvements to the house so our guests will have an enjoyable stay. Great house for any season! BEAR HAVEN is the perfect home to gather family and friends for your year-round fun and wildlife viewing. Play ping-pong or pool in the large Game Room (complete with plumbed bar and entertainment area) and soak in your own professionally serviced hot tub without leaving the house! A fantastic location in the Chamberlands area of Homewood means we have skiing at the end of the road at Homewood Mountain Resort in Winter, a private beach/pool/tennis on the Lake in Summer. Open space trails extend behind our rustic three level A-frame, which is also close to the west shore bike path.The house is 3 levels: 1st floor has mud room, game room, master (king bed), full bath and laundry room.The 2nd floor has open living room/kitchen, bedroom (queen and twin), 3/4 bath, large front deck and back deck with new spa and 5 burner gas grill BBQ. 3rd floor has two bedrooms (queen and full beds in front; queen and twin beds in back) These share a 1/2 bath and each has a small deck. Spring and fall are the best in Tahoe, crowds are gone and wildlife abounds. Park your car and bike or hike in the woods right out the back yard or down the bike path. Our families build natural forts right out the back! Walk or bike to the General Store/Deli in Homewood or along the bike path to the beach and Tahoma amenities. Very quiet and peaceful. Relax in the private hot tub or by one of the warm wood fireplaces! Shuttle Bus Service approximately July 1st-August 20th 11:00-6:30pm and passes right in front of Bear Haven. Grandma, grandpa and the young ones can come and go while the older kids hang out at the beach all day! Guests to the west shore are often confused about the summer amenities here: The amenities are actually two memberships, one to the Chamberlands Beach and Mountain Club which maintains the two private beaches with roped swim areas, lifeguards, paddle boats and summer day and evening family activities. The second is the Chamberlands Recreation Club which includes and maintains entrance to the private heated pool with lifeguards, lounges and private restrooms. The private pool and beaches are integrated into a public pier, bar and restaurant right on the lake. Free Family Movie Nights Wednesdays at the Beach early July to early August : Bring chairs, blankets, cooler, flashlight and container for trash. Free popcorn! The origin of these clubs can be confusing. Upon developing the Chamberlands condominiums about 35 years years ago, the adjacent homes in Chamberslands I and II were offered a chance to purchase a membership in one or both clubs. The opportunity for the pool/tennis club was once in a lifetime and is linked to the specific home's title. At this time, most homes in Chamberlands maintain a membership in the Beach and Mountain Club, while only a portion of homes have access to the pool and tennis facilities with a hefty yearly fee. We have both. This part of the lake also has a public portion of beach available to other homes in the area (ex:Tahoma, McKinney, Homewood) which is on the southern edge of this sandy beach area of Lake Tahoe. WINTER: Enjoy a 3-day weekend, Our guests love to ski at uncrowded Homewood Mountain Resort (walk or ski down Lagoon Road); then ski into the backyard for intermediate skiers, depending of course on snow conditions. The ski area has lots of promotions for lift tickets, check their website skihomewood . A retired UCLA trained dentist now living in Jackson Hole Wyoming. Spent many years in the Bay Area and this was our family cabin when my sons were growing up. We now have wonderful liasons living and working in Lake Tahoe that help us maintain our cabin for our many guests. Lake Tahoe can be SO busy any time of year, but the West Shore is the prettiest and quietest. We enjoyed parking the car during visits and not using it again until it was time to go back home. The open space behind the house and quiet street were a stark contrast to our home in Ross and the hiking is awesome. This part of Homewood/Chamberlands neighborhood only has two roads above West Lake Boulevard, which allows easy access by bike, and creates a quiet neighborhood with few cars so the boys could play in front or back. The lake is quite close by and we would have a much better view of it if there weren't so many beautiful conifers growing all around us! Truly feels like the woods! The early nineties were drought years and Tahoe had very little snow. Being on the 'shady' side of the lake, the little snow that there was would last much longer than anywhere else...making for snow play all winter! Lake Tahoe's shoreline is primarily private, so we wanted a home that also had access to a beach. Chamberlands is one of the nicest clubs in Tahoe with sandy beaches and all its facilities together at the lake. What a wonderful setting! More wonderful family memories at a fun cabin in the woods with wildlife and recreation all around us. The game room was always the boys domain and the separate kitchen/living area always seemed to be the adults' hangout. The three levels gives everyone a bit of space and privacy when desired. The hot tub on the back deck is in a wonderful forest setting, and although we have neighbors to the north and south, the situation of our home slightly to the west gave us total privacy there. Forest setting with a peak of Lake Tahoe from 2 of the 3 levels. Approximately 11/2 blocks from the Lake. Ski down the road when snow-covered, then 1/2 block walk slightly uphill to Homewood South Day Lodge and Quail Chairlift. Fully stocked with many extras. Bench style dining table with end chairs - seats 8-10 plus folded square card table and chairs. Also highchair and toddler booster seat. Professionally serviced. Very private setting surrounded by forest on-mid level back deck. New in 2014. We enjoyed our stay very much. Nice accommodations, plenty of supplies and good condition. 1) Mid level fireplace vent was stopped up after the first 20 minutes, created a lot of smoke in the room. Unable to enjoy a fire the rest of the weekend. Very disappointing for me, personally. Especially after buying wood. 2) Hot tub not warm enough to use. Also, it sounded like it ran all night long. 3) On Sunday the mid level bathroom toilet stopped up and we could not unplug it with the plunger. 4) We were unable to open the window in the mid level bedroom. Glad you had a good stay, we try hard to be sure that everything is in order. Please let us know when there is a problem, we can address it while you are at the house. Hard to correct it when you are home! 1. Not sure what could have happened with the fireplace, it has been working all season. 2. House keeping got to the house and saw your note, the temp was on 86 when they arrived, turned the tub up to 102 and it heated up right away. 3.any chance dipers or flushable wipes were put in the toilet? (Flushable wipes are not flushable! Makes no sense) had a plumber out to clear and what every was put in the toilet had to be pushed down the line. 4. Cleaners also tried the mid level bedroom window and it opens, however there is a storm window on it that does not open. Great property with plenty of entertainment for kids and adults! We had a great time at the bear haven, from playing games in the game room to sledding in the back yard to sitting by the fire and relaxing in the sauna on the deck. The only issue we had with the place was the driveway was a little steep and icy. We couldn’t park up by the cabin but there were two spots on the bottom of the driveway. It was a little hazardous for the kids walking up and down, we used all the sand they had. I understand they’ve had a lot of snow this winter so that probably led to the driveway issue. There was plenty of entertainment for the kids and the south lift of Homewood was rite around the corner, we also skied back to the cabin through the woods which was convenient. Overall we had a really great time at the Bear Haven. Our family just stayed at Bear Haven with two other families and had a wonderful time! The house is great for groups with 3 floors and a bathroom on each floor. The game room with the pool table and ping pong table was a huge hit with our kids, and the hot tub was a wonderful way to wind down after a day of skiing. The house is well stocked with everything you need to cook, etc. and the beds are all very comfortable. We skied at Homewood, which is very close to the house. We were not able to make it up the driveway due to the snow / ice (driveway is steep) - but there were parking spots at the bottom of the driveway and we were fine with carrying our stuff up to the house. Debbie and Dan were very easy to work with, responsive, flexible, etc. Would definitely stay here again! 4 adults and 4 kids stayed here while skiing at Homewood and had a fantastic time. House is very spacious and comfortable for 8 and kitchen is very well stocked. Highly recommend. Very convenient,clean, comfortable and well-stocked with everything we needed! We really enjoyed staying at this cabin! It worked so well for our family; it was clean and well-stocked with everything we needed. It was cozy and comfortable and very well located on a quiet street very close to Homewood Ski Resort and with easy access to grocery stores, restaurants, etc. in nearby Tahoe City. The kids loved the game room, and we all enjoyed the big hot tub right on the back porch. I will say that the driveway in winter, however, was pretty intimidating. Even though we have 4-WD, it was too slippery to go up, so we carried everything from the car. Walking up was also slippery; luckily there is a handrail, and it was helpful to have the motion activated lighting at night. I would not recommend this house for winter use to anyone with mobility issues.